Daredevil, the blind avenger of Hell's Kitchen faces a life changing decision when he is presented with the chance to see again. But at what cost will Matt regain his sight? Guest starring Bullseye! 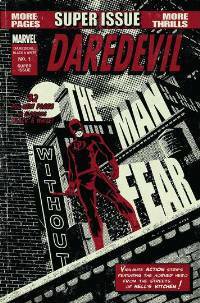 The Kingpin of crime, ever the Machiavellian mastermind, uses lawyer Matt Murdock's quest for justice against him in a deadly money-making scheme. And the Man Without Fear finds himself embroiled in a gang war in Japan. All this and much more in this all-new, all-black-and-white one-shot in the spirit of the Mighty Marvel Magazines of yore, but ALL-NOW in style!